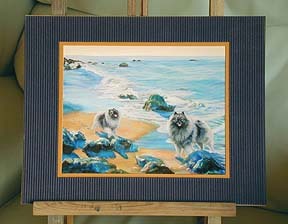 The originals for these were oil paintings that I have done. The prints are made on a special printer I bought just for the purpose several years ago. Most printers use dyes that fade and discolor over time. My special printer uses pigments instead of dyes, which will not fade for 100 years if protected from direct sunlight. 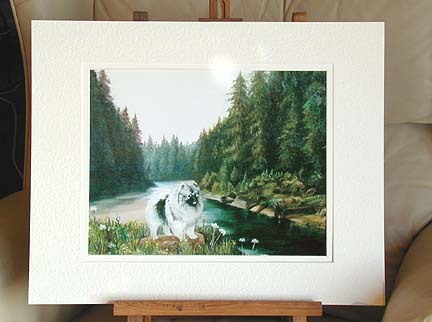 The prints will last for 2 or 3 years even in direct sunlight before fading or discoloring. I make the prints on heavy archival papers made specially for this printer. I make trial prints with the original painting in front of me for reference, until I get the brightness, contrast, and color balance very close to the original painting. I sell prints made after I have determined the perfect balance for full price. Trial prints that are not 100% accurate but still attractive I sell at a reduced price as imperfects. In most cases, if you don't have the original in front of you you would not know there is anything wrong with the print. If the original painting was 16x20 or 18x24, I make the print size 11x14. 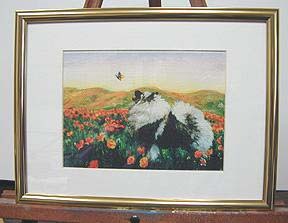 After matting, the frame size is 16x20. If the original painting was 8x10, I make the print size also 8x10. My printer will print images up to 12x18 in size but that would need custom framing. I do some prints on actual canvas, that may be framed without glass like a real oil painting. That is a very expensive and time-consuming process with a lot of wastage. For each perfect print, I usually get 2 or 3 unusable ones. The special canvas prints come out of the printer wet. If any part of the surface touches any part of the printer in the process, the pigment is streaked or smeared. I have to remove the guide rollers and hand guide each canvas print, and hope that nothing touches anything along the way. When a perfect print comes out of the printer, it has to dry for a day and then I mount the canvas on stretcher bars and add a protective coating. These canvas prints are thus quite expensive -- but they are beautiful. I donated this painting to the "Fur Your Eyes Only" art auction at the 2006 National. I just finished this painting for the 2006 National. The 16x20 original oil is for sale -- see my Paintings page. A framed 11 x 14 print of it went into the Silent Auction. 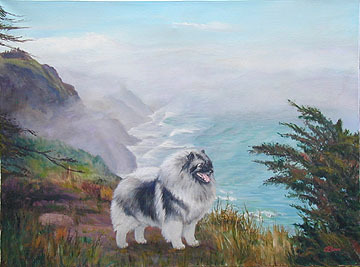 I donated this painting to the "Fur Your Eyes Only" art auction at the 2005 National. 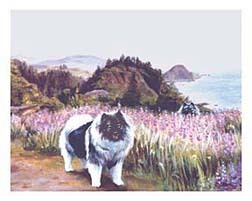 The standing dog is Ch Keesbrook's Believe 'n' Magic (Smokee), and the bowing dog is Ch Trumpet's Mr. Bojangles (Dylan). 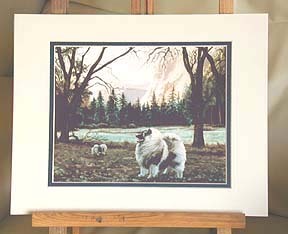 I have 2 of them, one matted in slate blue, the other in a muted dark teal. 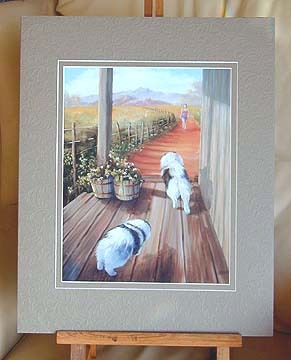 I donated this painting to be auctioned at the 2003 National with the winner's dog to be added to the painting. The winner was Joanne Reed and the dog is Badger. 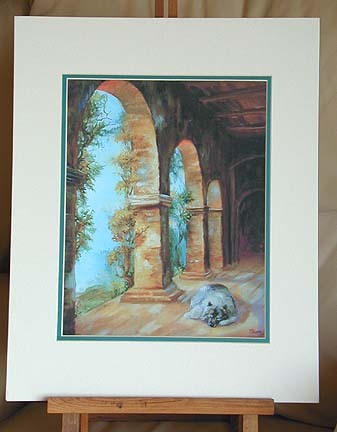 The one in the dark muted teal mat as shown is SOLD, but I have another in a white mat with a teal inner mat. 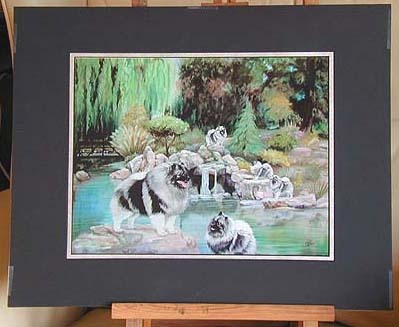 I painted this on commission from Joanne -- it shows 5 generations of Windrift dogs on Joanne's favorite golf course. 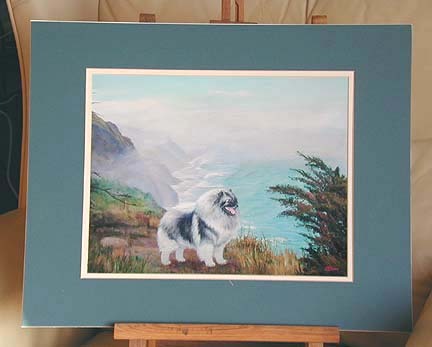 I exchanged the painting for a beautiful puppy, now Ch Windrift's Wind Song. I currently have no copies of this print, but I can make more. 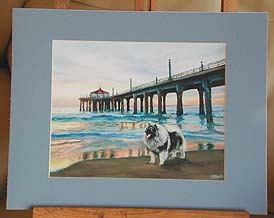 I donated this painting for the Rescue raffle at the 2001 National with the winner's dog to be added to the painting. The winner was Florafae Schoen and the dog her Beau. 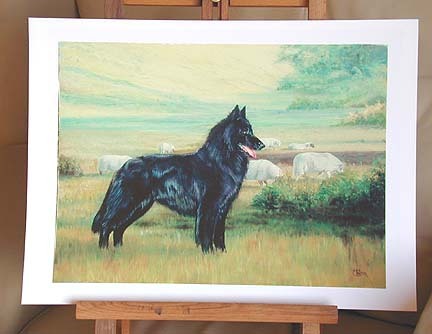 I donated this painting for a BOB trophy at the 2003 National. I donated this painting for a BOS trophy at the 2003 National. 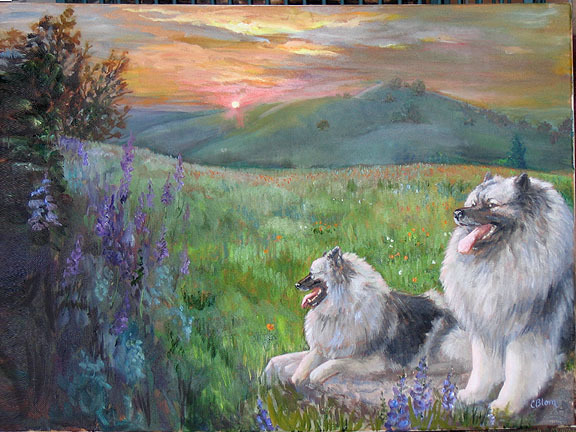 I did this painting during a painting class, then added the dogs to it! 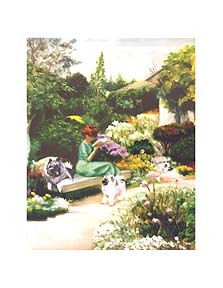 I did this painting during a painting class, then added my old dog Singer sleeping in the sun. The dog is Eng Ch Valkanties Sgt Pepper. 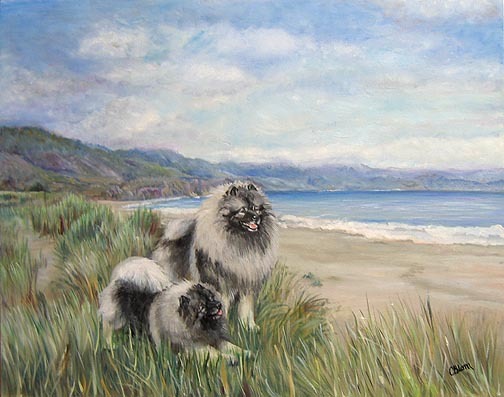 This little painting was the first one I did with a Keeshond in a landscape. 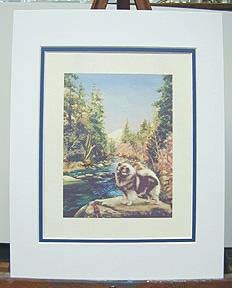 I donated this little painting for the BOS trophy at the NorCal Kees Club Specialty in 1996. It has been one of my most popular paintings. 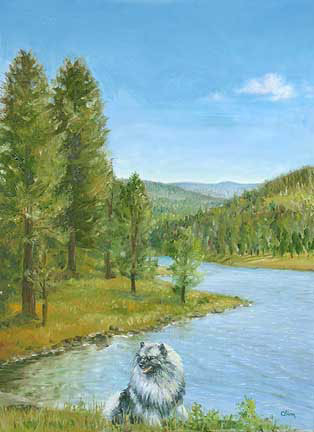 I donated this little painting for the BOB trophy at the NorCal Kees Club Specialty in 1996. I did this little painting for the 1996 National in Northern California, whose theme was "Go for the Gold". I did this painting on commission.